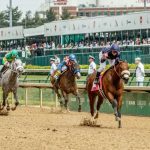 Kentucky Derby 2016 Results, Payouts, Photo Gallery: Under partly cloudy skies, Kentucky Derby Day 2016 is underway at Churchill Downs. 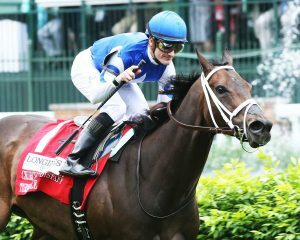 Tepin became the second horse to repeat in the $300,000 Churchill Distaff Turf Mile. 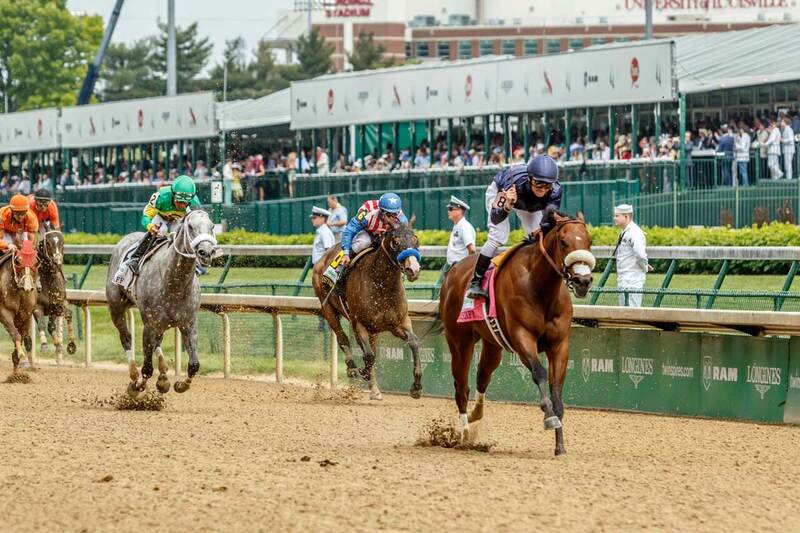 Catalina Red put away a stubborn Holy Boss at the eighth pole and then held off bids from Calculator and Kobe’s Back to win the 82nd running of the $500,000 Churchill Downs. Taris Romped To Humana Distaff Victory. 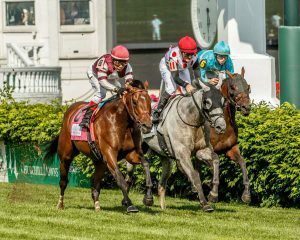 Camelot Kitten won the American Turf Stakes for Ken and Sarah Ramsey. 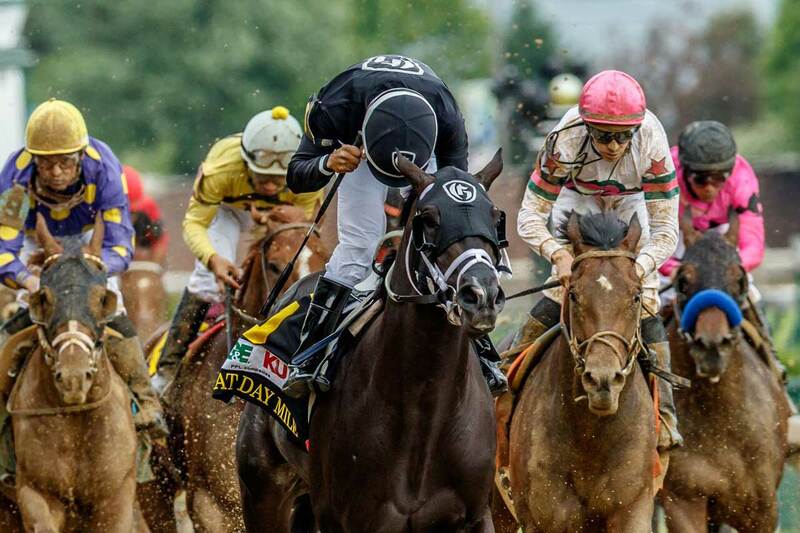 Sharp Azteca swept past the pacesetting Imperial Hint at the head of the stretch and cruised to a 2 ½-length victory in the Pat Day Mile. 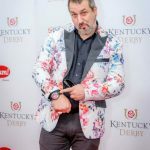 See below for a Kentucky Derby photo gallery along with Kentucky Derby Day stakes results and payouts for Saturday, May 7, 2016. 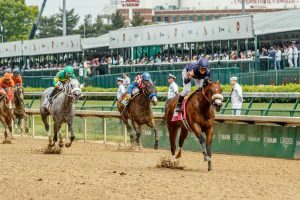 Nyquist and jockey Mario Gutierrez won the 142nd running of the Kentucky Derby on Saturday, May 7, 2016 for trainer Doug O’Neill and owners Paul and Zillah Reddam. 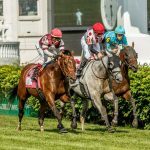 Nyquist and jockey Mario Gutierrez won the 142nd running of the Kentucky Derby on Saturday, May 7, 2016 for trainer Doug O’Neill and owners Paul and Zillah Reddam. Nyquist was bred by Summerhill Farm in Kentucky. 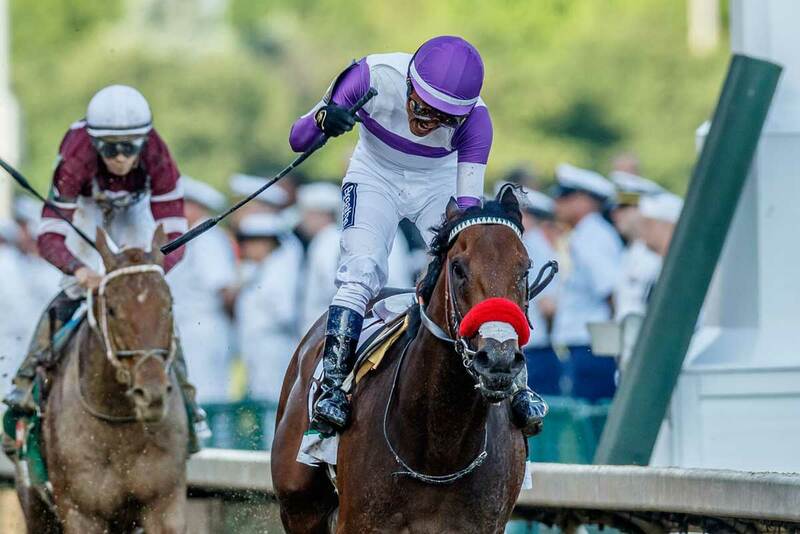 Nyquist was the eighth undefeated horse to win the Kentucky Derby. 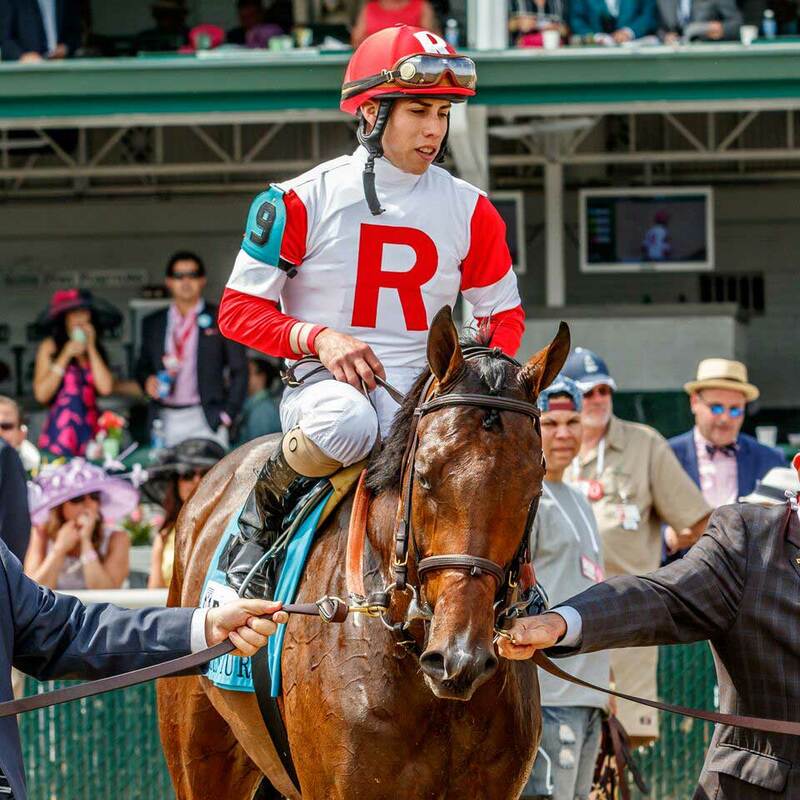 Despite remaining undefeated, Nyquist failed to attract the major hype and attention one would expect from a Kentucky Derby (GI) favorite, partially because of the disbelief surrounding his potential to win at 10 furlongs. 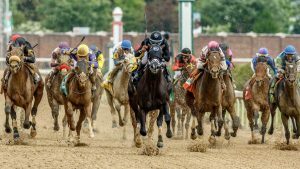 Nyquist proved his critics wrong today at Churchill Downs, as he held on to win the Derby over his usual foe Exaggerator. Danzing Candy, as expected, set the pace and went through quick opening splits of 22 and change and 45 for the first half mile. He faded and set the stage for Gun Runner on the inside and Nyquist. 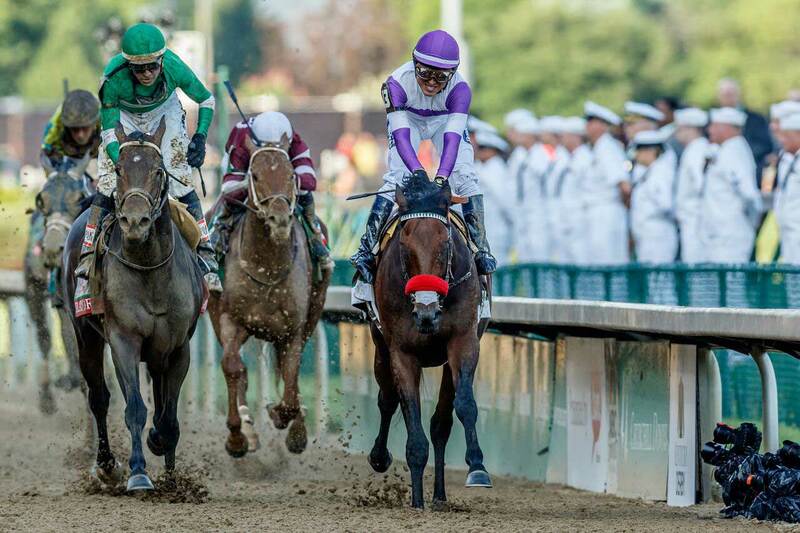 The horses straightened out and Nyquist began to look like the winner. Exaggerator tried to come on late, but as in their previous matchups, just could not find enough. Gun Runner held on for a desperate third. Mohaymen completed the superfecta by finishing fourth and Suddenbreakingnews rounded out the Top 5. Now, Nyquist will make his run at the Triple Crown by competing in the Preakness Stakes (GI) at Pimlico Racecourse in two weeks. 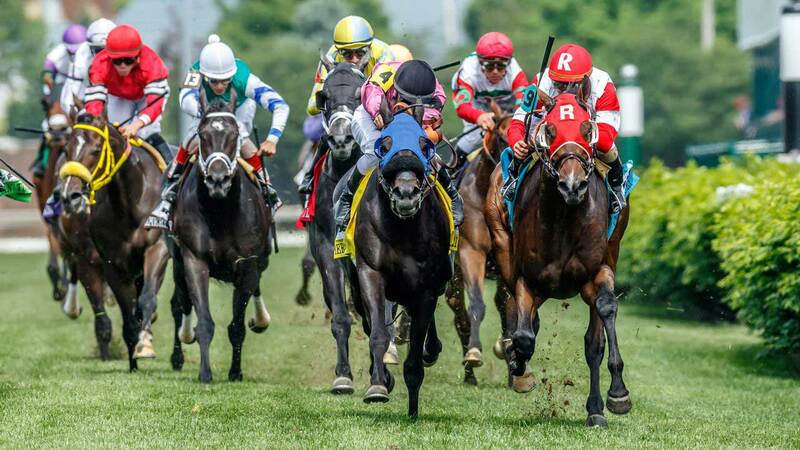 Recent history shows that horses with speed or tactical speed fare extremely well in the second leg of the Triple Crown, which is a good trend that works in favor of Nyquist. 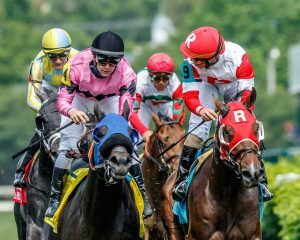 Robert Masterson’s champion Tepin became the second horse to repeat in the $300,000 Churchill Distaff Turf Mile Presented by Longines (GII) for fillies and mares by romping to a 3 ½-length victory over Rainha Da Bateria in the 31st running of the race. Trained by Mark Casse and ridden by Julien Leparoux, Tepin covered the mile on a firm Matt Winn Turf Course in 1:34.36. Tepin joins Foresta (1990-91) as the only repeat winners in the race. It marked the third victory in the race for Leparoux, who also won in 2013 with Stephanie’s Kitten as well as last year on Tepin for Casse. The victory, the sixth in a row for Tepin and ninth in her past 11 starts, was worth $182,280 and boosted Tepin’s earnings past the $3 million mark at $3,078,253 with a record of 19-11-3-1. The champion older filly or mare turf performer of 2015, Tepin is a 5-year-old Kentucky-bred daughter of Bernstein out of the Stravinsky mare Life Happened. Isabella Sings set the pace, leading the field of seven through fractions of :23.35 and :46.06 as Tepin tracked in second about five length back. On the far turn, Leparoux sent Tepin after the leader and by the top of the stretch the race was over as Tepin swept past and drew clear without opposition. 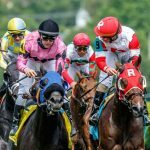 Tepin returned $2.60, $2.20 and $2.10. 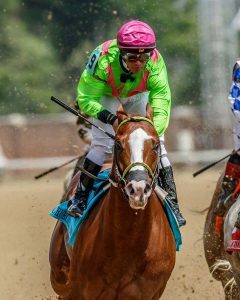 Rainha Da Bateria, ridden by Javier Castellano, returned $6 and $4 and finished three-quarters of a length in front of Cash Control, who paid $4.60 to show under Shaun Bridgmohan. It was another 1 ¾ lengths back to Zipessa who finished fourth and was followed in order by Bureau de Change, She’s Not Here and Isabella Sings. 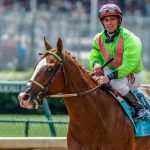 Anthony Lenci’s Catalina Red put away a stubborn Holy Boss at the eighth pole and then held off bids from Calculator and Kobe’s Back to win the 82nd running of the $500,000 Churchill Downs Presented by TwinSpires.com (GII) for 4-year-olds and up by a length. Trained by Jorge Navarro and ridden by Javier Castellano, Catalina Red covered the seven furlongs on a fast track in 1:20.79. 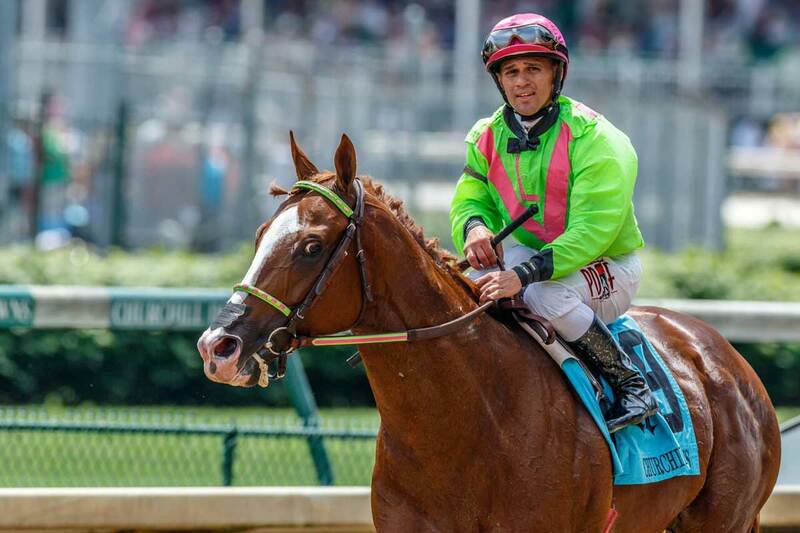 It was the second consecutive win in the race for Navarro, who saddled Private Zone last year. 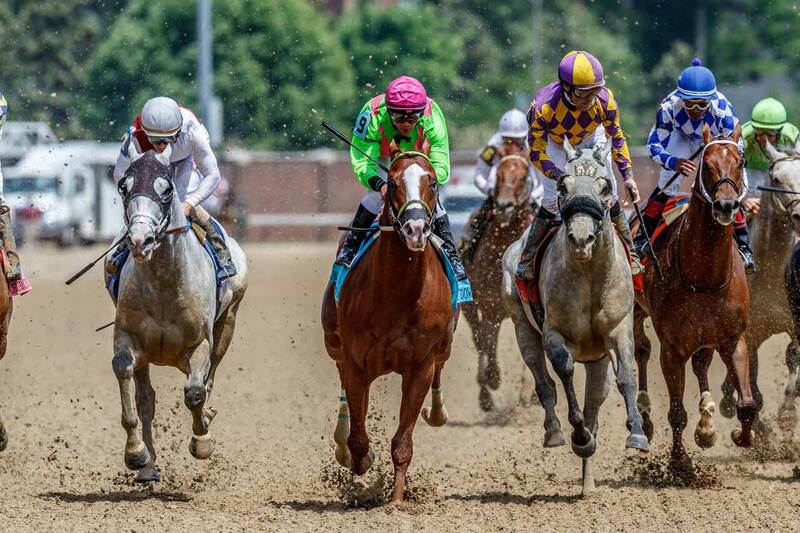 Limousine Liberal led the field of nine through fractions of :22.24 and :44.64 with Holy Boss in closest pursuit and Catalina Red sitting in the second flight. As the field hit the top of the stretch, Catalina Red moved three wide to collar Limousine Liberal and Holy Boss with Limousine Liberal the first one of the three to check out. Catalina Red drew clear of Holy Boss at the eighth pole and had enough left to turn back Calculator and a fast-closing Kobe’s Back. 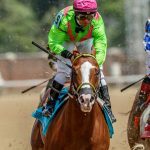 The victory, the first graded stakes triumph for Catalina Red, was worth $297,600 and boosted the 4-year-old’s bankroll to $469,885 with a record of 10-5-1-2. 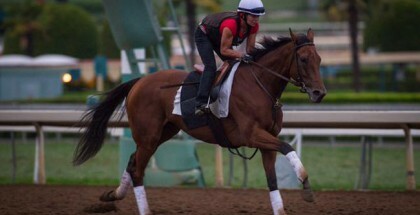 Catalina Red is a Florida-bred son of Munnings out of the Freud mare Lovely Dream. 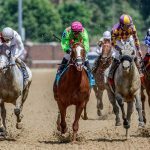 Catalina Red returned $30.20, $13.80 and $7.40. Calculator, ridden by Junior Alvarado, returned $7 and $4.40 with Kobe’s Back finishing three-quarters of a length back in third under Gary Stevens and paying $3.60 to show. It was another three-quarters of a length back to Salutos Amigos in fourth with Holy Boss, Limousine Liberal, Squadron A, Speightster and Barbados following in order. 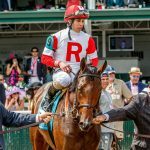 Divisidero stormed home in a thrilling stretch-duel to win the Grade I Woodford Reserve Turf Classic a head over World Appeal. The race was accident marred starting with the scratch of Grand Tito in the paddock. A sudden rainstorm produced strong winds that startled Grand Tito and caused him to rear up and strike his head against a fence. 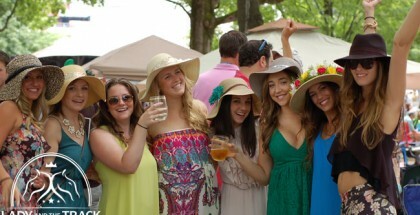 The horse was also hit by a piece of airborne debris. Early indications are that the horse suffered no major injuries. 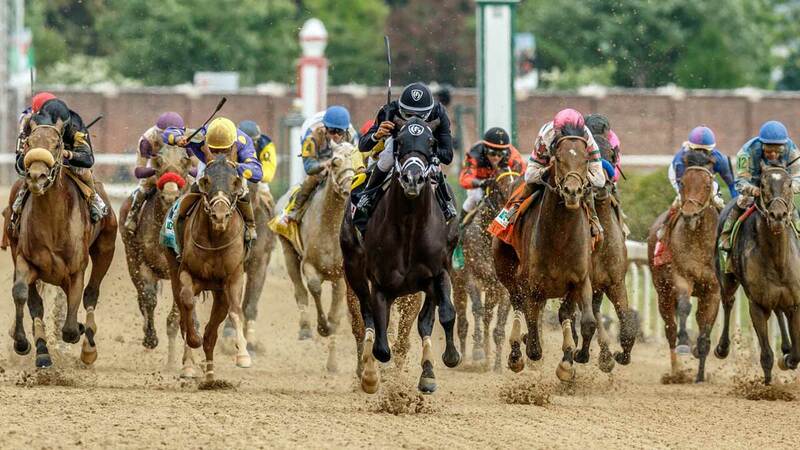 The race itself endured a two horse spill on the far turn just before the homestretch. Kasaqui ridden by Paco Lopez clipped heals with the horse immediately in from of him, stumbled unseating Lopez and causing Triple Threat to fall as well. The Bill Mott runner was ridden by Jose Lezcano. Both Lopez and Lezcano were shaken up but uninjured. 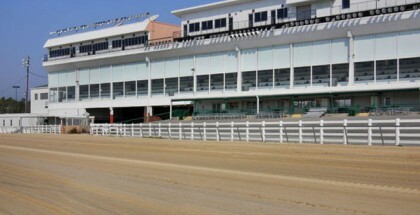 Preliminary reports show both horses suffered no major injuries as well. The eventual winner, Divisidero laid mid-pack through the race and edged forward on the turn home. World Approval struck the front in early stretch, and was confronted by the eventual winner with an eighth of a mile to go. Under strong urging from Hall of Fame jockey Edgar Prado, Divisidero lunged at the line to victory. Owner by Gunpowder Farm and trained by Buff Bradley, he returned $15.80 to win. 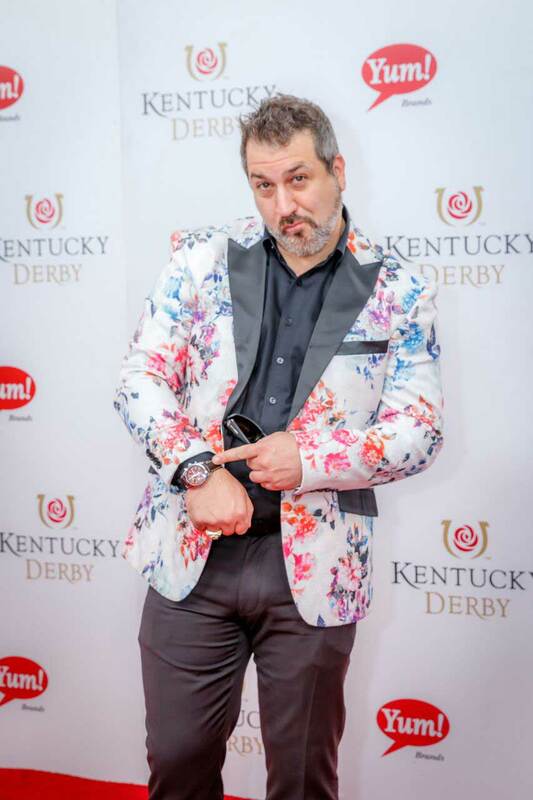 Previously a winner at Churchill Downs taking the 2015 American Turf, Divisidero set the stage of the heavyweight bout to come, the Kentucky Derby.